The traditional, basin-cut, short hairstyle may have been invented for men, but it’s ours now! LOL! Women on the prairies, cutting their men’s hair with a baking bowl guide, would never have believed ‘boy-cuts’ would be a hot look for women of the future! But they’re a trend that continues each new season, with trendy tweaks keeping it fresh. 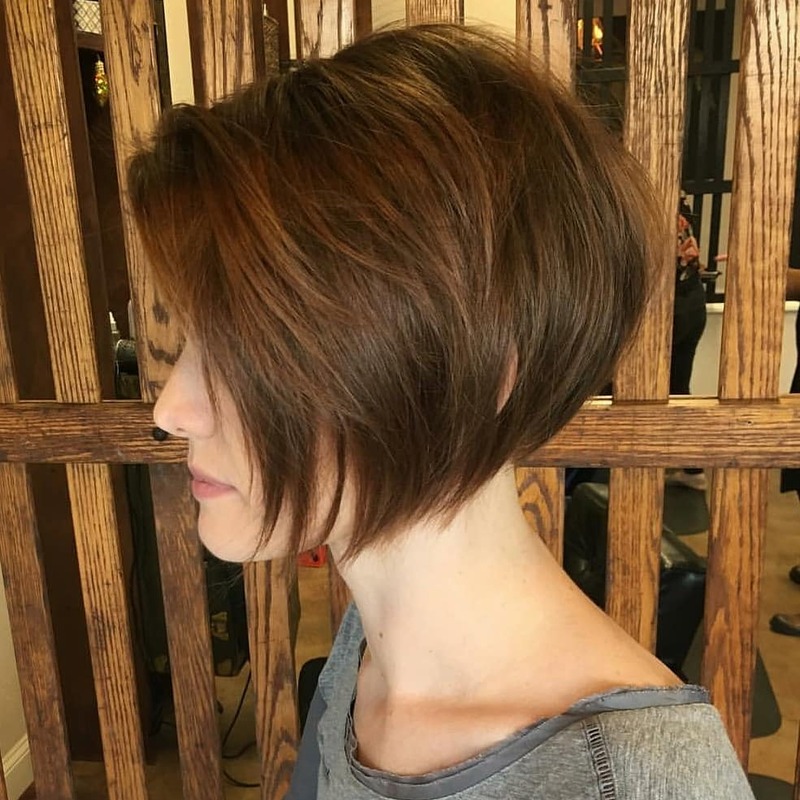 This short haircut is a lovely, hazelnut shade with lighter balayage and darker shading highlighting textured layers. Tousled sections add volume and movement around the crown and there’s a cute little point at the nape! Easy-care and wearable for any occasion, try this look with the latest, piecey, short bangs! 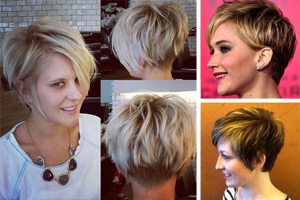 This carefully shaped pixie haircut shows exactly how to get the best from thick hair. Sliced layers are the way to create volume on top, tapering down to fine tips that lie neatly at the sides and back. 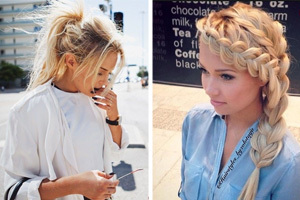 The result is a style that falls into shape after washing, and need very little styling time. The back has a cute, the nape shaped into two curved outer ‘points’, with an inverted V in the centre. And I love the clever shaping in the side-points. 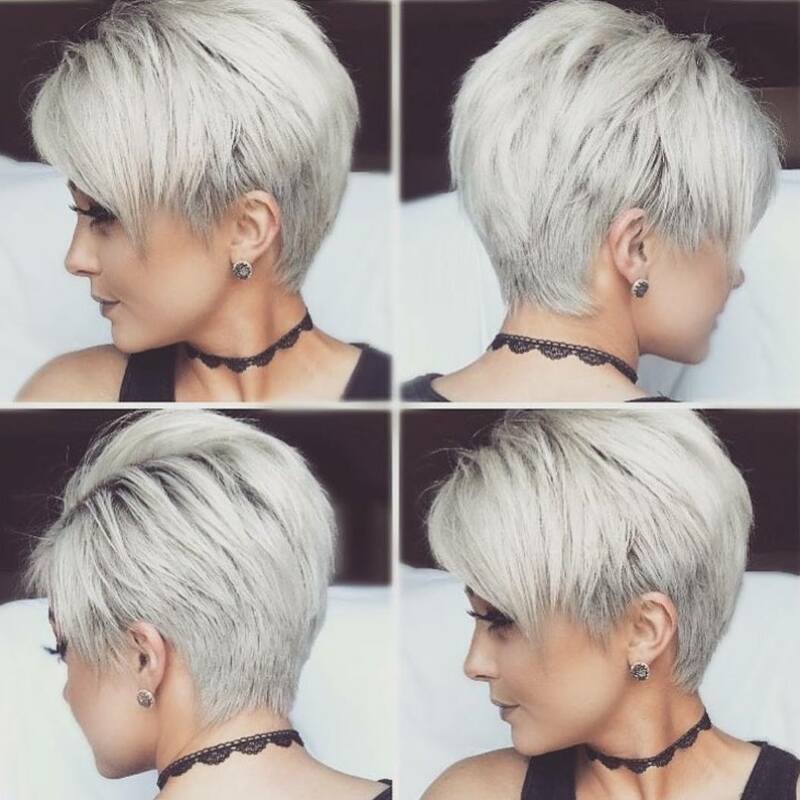 Light ash-blonde completes this easy-care, high fashion short haircut! This ash-blonde color doesn’t look right for the model’s natural coloring. Or perhaps it’s because the white, under-eye powder and red blusher shouldn’t be there! So always consult a properly-trained colorist to ensure you get a new color that flatters your natural complexion without make-up. When you know what shade suits you, you can always return to home hair-dyeing. 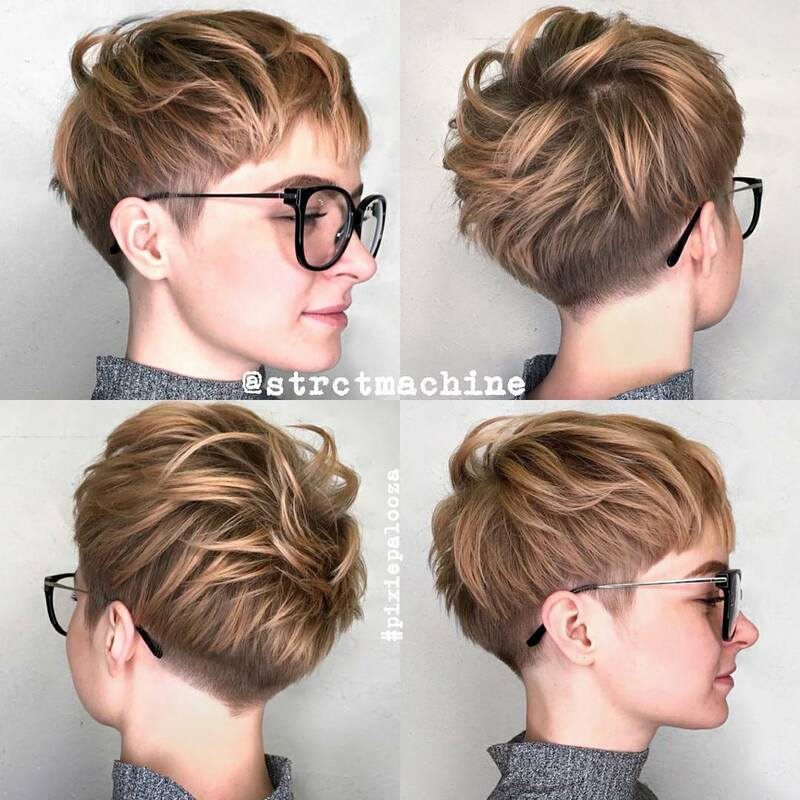 This fabulously fashionable, short haircut looks totally up-to-the-minute with a blurred side-part and attractive swept-over long bangs! Brown roots add color depth and the palette of brown and beige is highlighted with light ash-blonde. This avante-garde hair and make-up style look great on faces with a good bone-structure! Clipped-short back and sides, and fantastic forward layering get the most out of thick hair, with sharply tapered tips contrasting with buzzed texture. 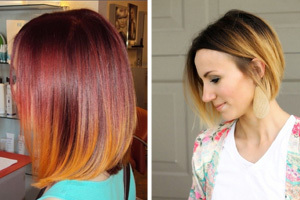 The strong lines are softened by gorgeous ash- and beige-blonde balayage, underpinned by a harmonious coffee-brown. The side-swept bangs are lifted lightly off the face and fixed with product. 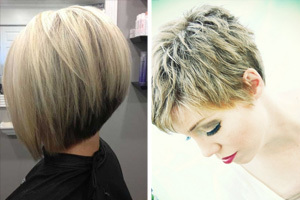 The diagonal line of this trendy, short haircut make it good for long, round and heart faces with warm skin undertones! Looking at this image, the impression I get is of some who’s calm and relaxed. And I know that a big part of that feeling is created by the style and color of the model’s hair! This soft and feminine look is a fashionable way to deal with hair that’s quite gray. 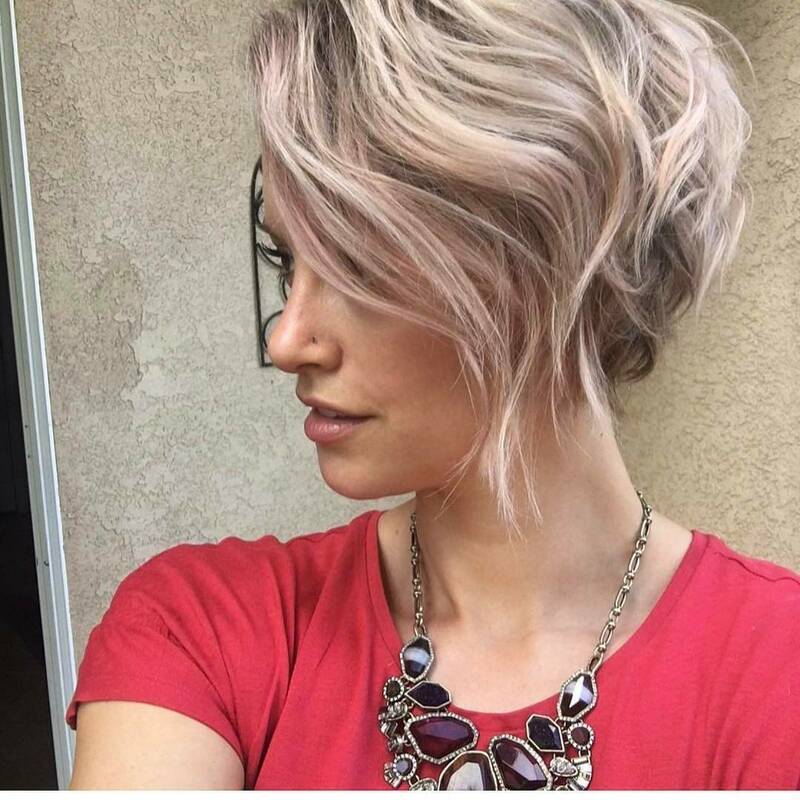 By keeping gray roots, and adding a light-beige blonde ombré with gentle pink balayage, you can retain your youthful vibe at any age. 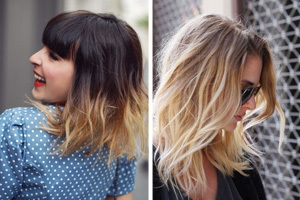 Thick hair with natural wave is cut in a short, angled-bob with a tousled, carefree finish. So no wonder she looks relaxed and quietly confident – this easy-care, playful look is also very alluring! 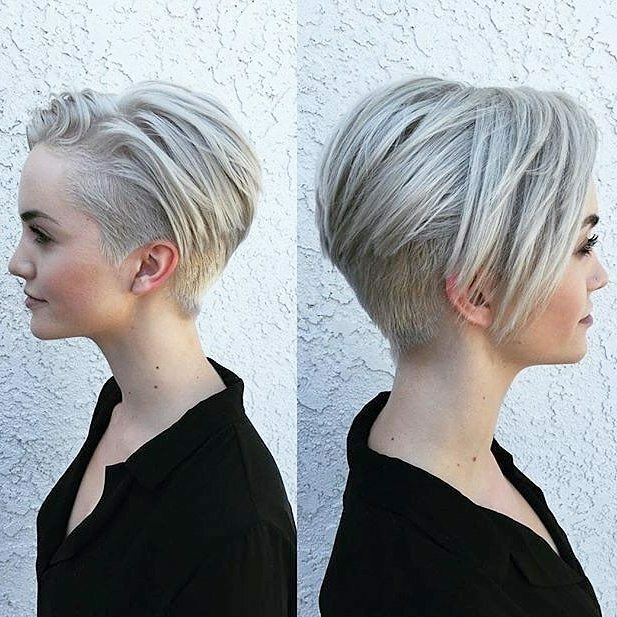 This straight short haircut has strong lines and a variety of different textures, giving it a minimalist vibe. Keeping hair all one color is a trendy fashion statement, when that color is a cool, silvery variation of ash-blonde. The short-back-and-sides shape is based on the ‘Eton Crop’ haircut worn by English, school boys in the 1920’s. Long layers at the back create a creative contrast with closely-clipped layers down to the nape. And from a deep side part, hair is casually flipped over to frame the forehead, or fall onto the face in the famous, ‘floppy-fringe’. The model has a complexion with cool undertones, so this silvery-gray color suits her complexion very well – without make-up. In black and white, this looks like an original photo of the famous Mary Quant ‘three-point’ bob. But the tattoo and bra-straps show it’s a more recent image. LOL! This iconic haircut really marked the modernisation of the whole, British fashion world and it’s just as fresh today. Long layers are cut vertically and given concave shaping at the ends to create a natural curved-in movement. There’s a modern twist in this cut, with the gentle ragged-edge texture at the nape and wispy tapered tips at the sides. And the three-points are one each side of the chin and that lovely V-point at the nape! Here’s another shade I can remember from the dim and distant past! But it wasn’t a hair-dye color until, well – this year! Salmon-pink started off as a popular shade for satin and silk lingerie, but it’s far too cute to be hidden away any more. 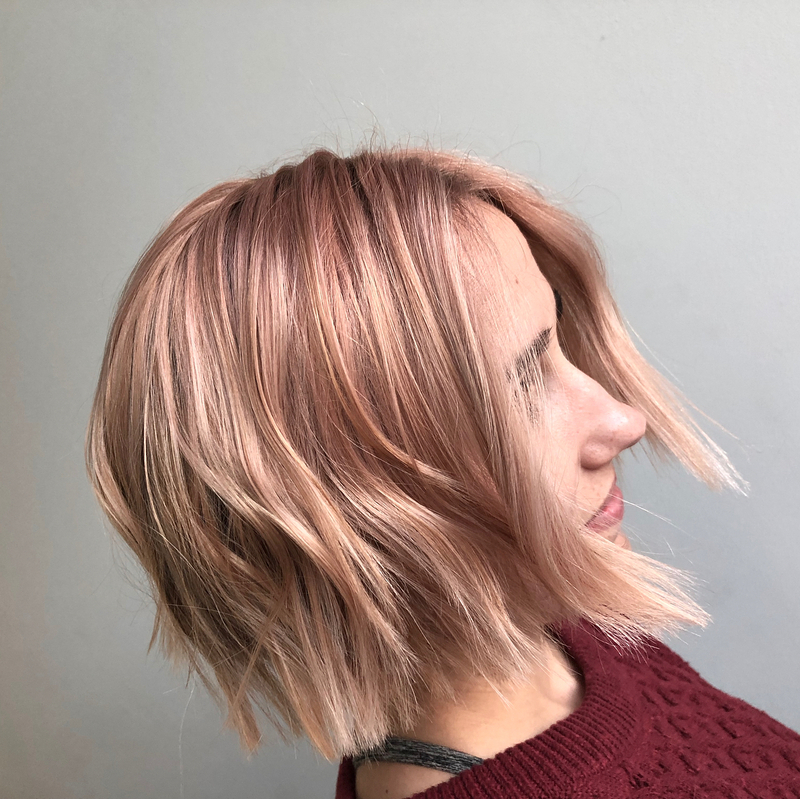 It’s a great blend of faded pink and copper-blonde shades, suitable for skin that has warm undertones. 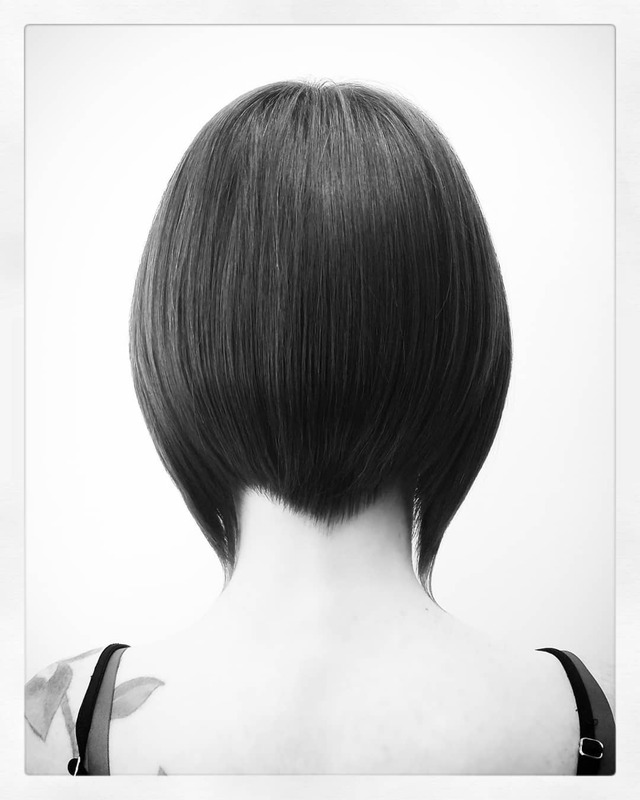 And combined with this choppy chin-length bob, it makes a fabulously modern, short hairstyles idea for this season! 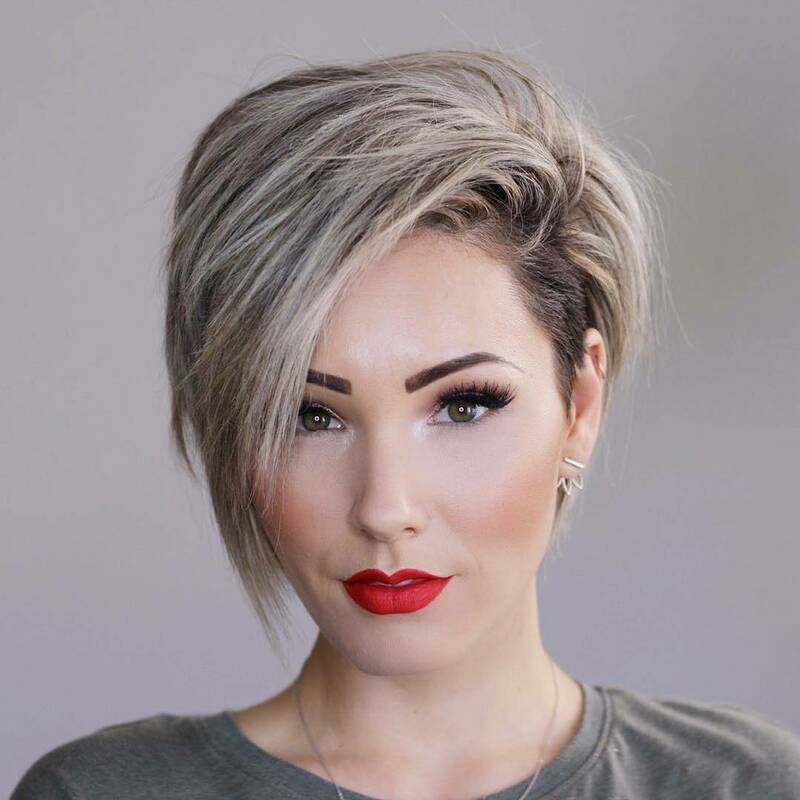 We tend to see a lot of edgy, extreme new hairstyles in the fashion magazines, but what if you just want an attractive hairstyle you can wear every day? Natural-look hairstyles don’t get as much media coverage as way-out shockers. 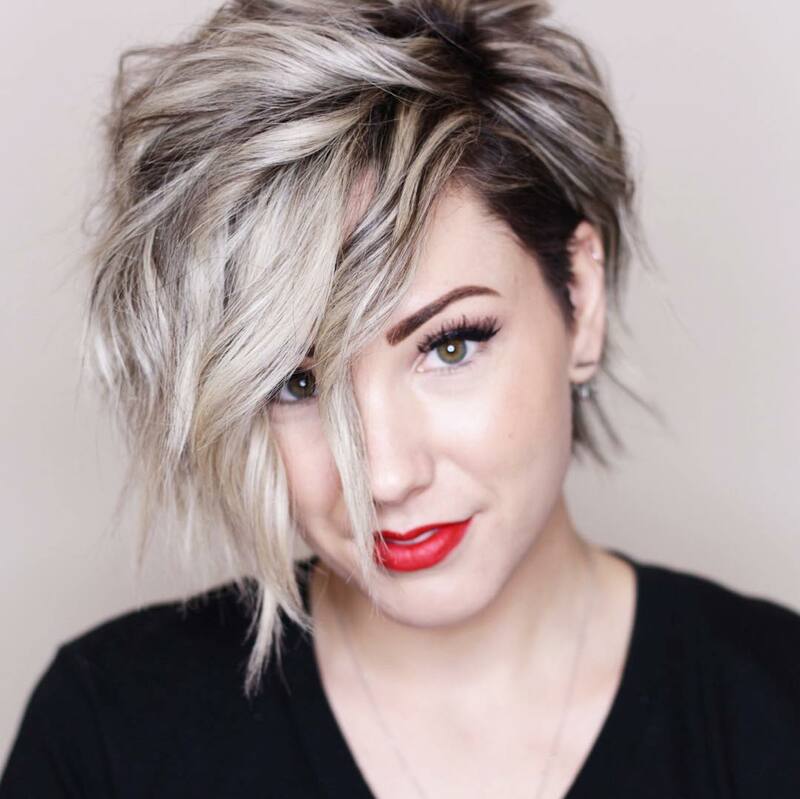 But here’s one of our favorite short hairstyles – an easy-care, lightly angled bob you can wear on any occasion for a low-key, attractive and fashionable image. 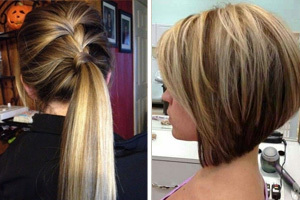 The light-brown shade is great for adding color definition to dark-blonde/mousey hair, without making a drastic change. And if this model appeared on tv show, ‘Snog, Marry, Avoid’ – you can bet she’d be chosen as the ‘Marry’ option! 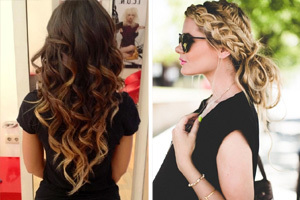 10 Wavy Haircuts for Medium Length Hair – Color Me Gorgeous!10 Wavy Haircuts for Medium Length Hair – Color Me Gorgeous!